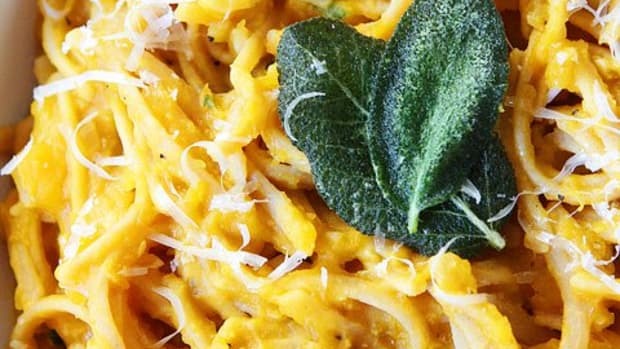 Spaghetti squash is a remarkable vegetable. Its flavor is mild, somewhere between butternut squash and zucchini and its pretty mellow yellow color houses bright yellow flesh. 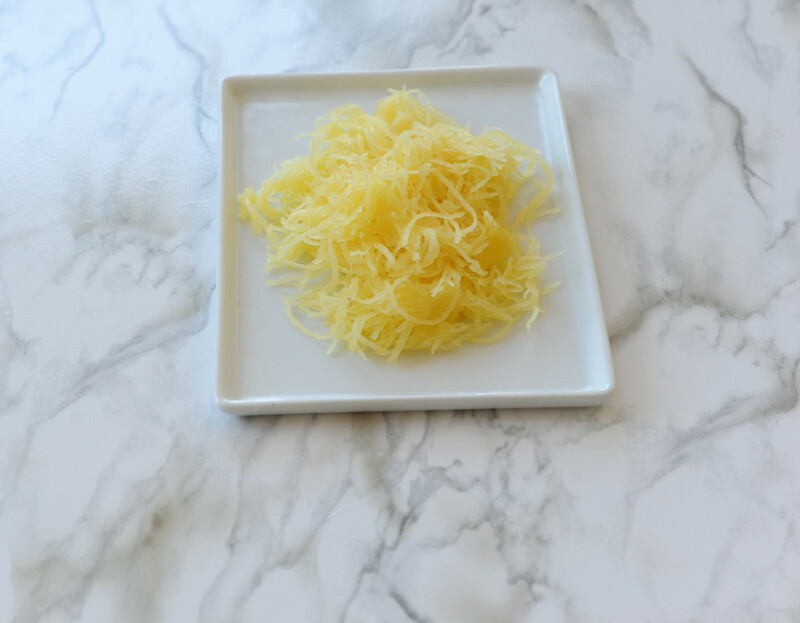 But spaghetti squash is most remarkable because of the structure of its insides. The flesh is comprised of hundreds of interwoven strands that stand up to cooking. The pasta-like strands peel away easily with a fork and the texture is refreshingly sturdy. 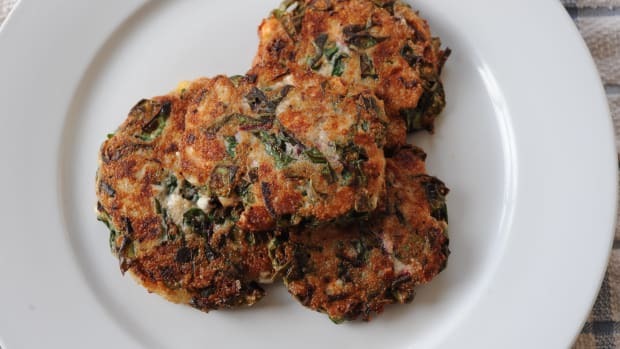 It’s an excellent substitute for pasta and is delicious coated in this fragrant sage sauce. 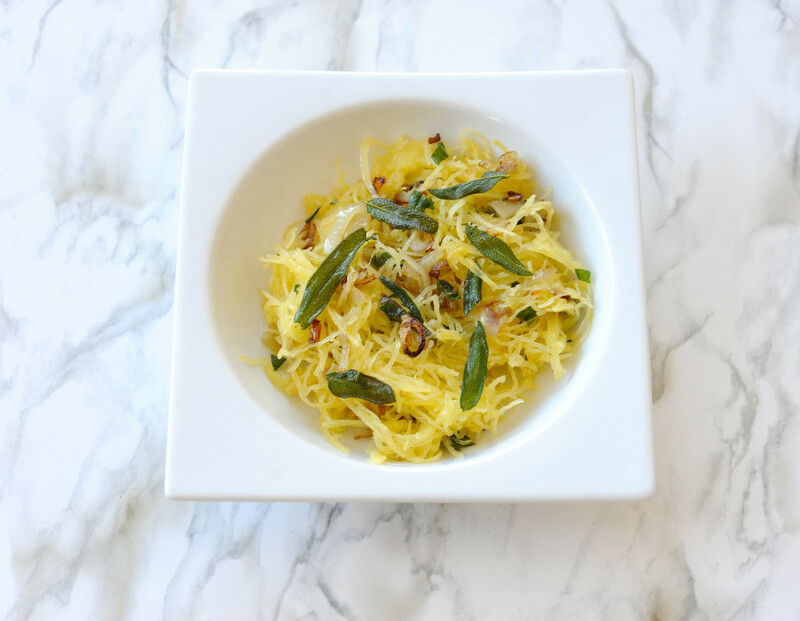 By delicately frying the sage leaves, the flavor is enhanced in delicious crispy morsels in this spaghetti squash recipe. I’ve found the best way to cook spaghetti squash is to roast it in a shallow baking dish with a bit of water. 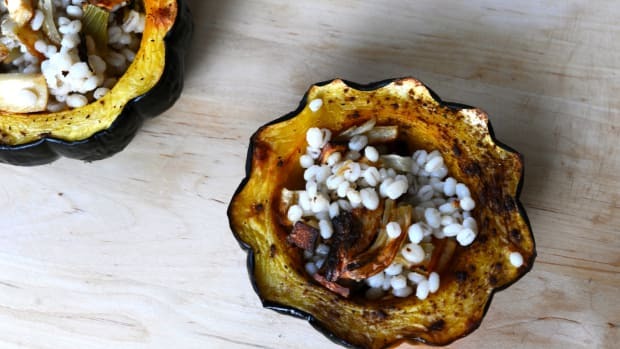 Using this method helps keep the squash moist while the insides cook perfectly. 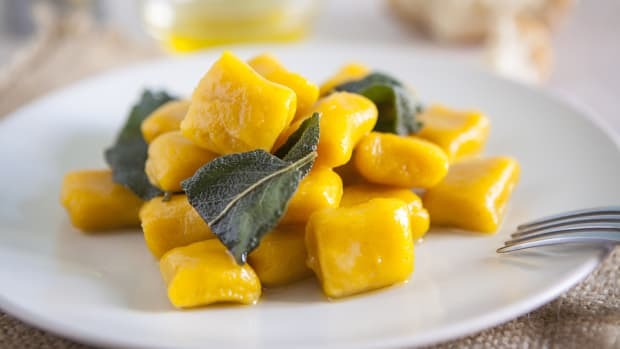 Inspired by a recent meal of butternut squash ravioli with sage brown butter, I developed this MUCH healthier version using sage, shallots and olive oil. 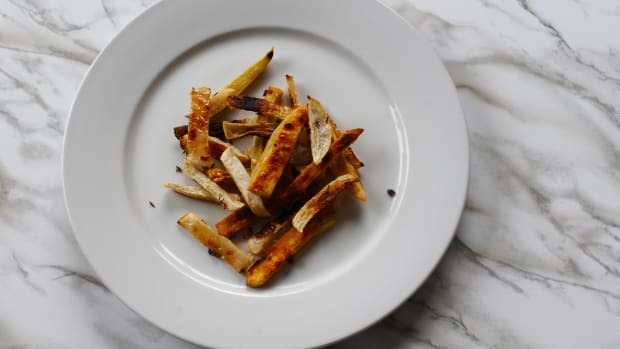 To save time, you can also roast the squash a day or two before you&apos;re going to make the sauce. Simply, store the strands in an air-tight container in the refrigerator and bring to room temperature before you fry the sage and shallots. 1. Preheat your oven to 350 degrees Fahrenheit. Using a sharp cleaver or kitchen knife carefully cut your squash in half lengthwise. You may have to use force so be very careful. If you are having difficulty, cook the squash whole for 10 minutes to soften and then slice in half. 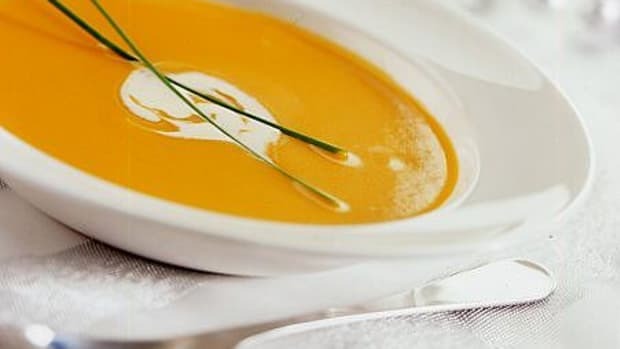 Place the two squash halves face down on a rimmed baking sheet or large glass dish with 2-3 cups water. There should be about ¼ inch of liquid. Cook for 35 minutes and remove carefully from oven to cool. Drain the water and allow the squash to come to room temperature. 2. Using a fork, shred the strands of squash from the skin. 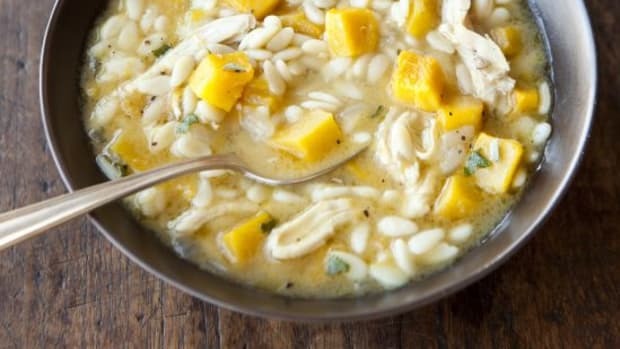 If the squash is cooked correctly, pasta-like strands will easily peel away as you use a fork to scrape. 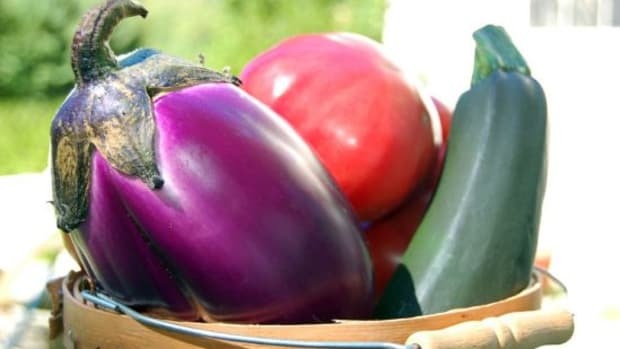 Continue until you have harvested all of the squash and discard the skin, set aside. 3. 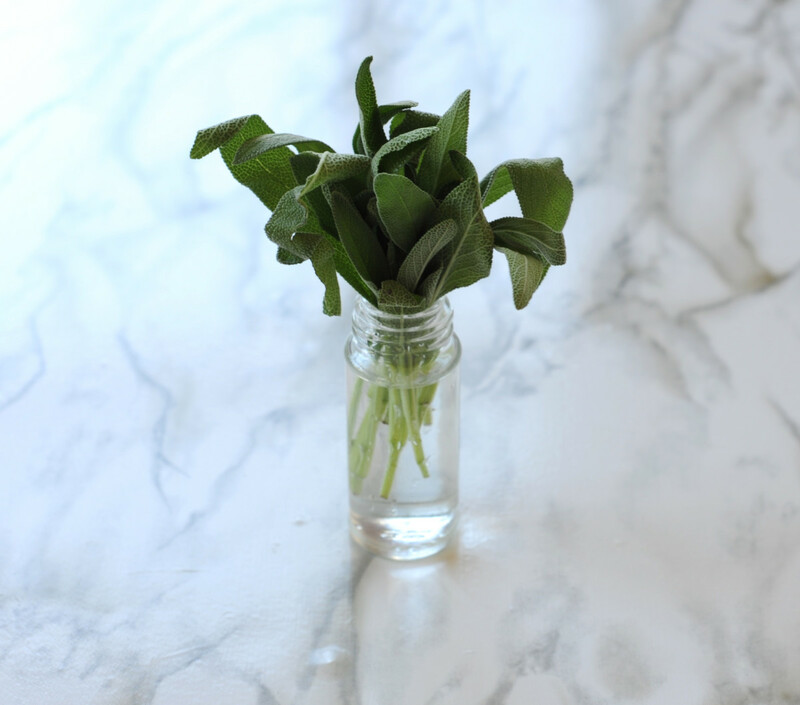 Chop ½ of the sage leaves into tiny ribbons and leave the remaining 15 whole. Roughly chop the shallots into rings and set aside. 4. In a large non-stick skillet heat 2 tablespoons of olive oil over medium-high heat. Make sure the oil is very hot and add the chopped and whole sage leaves in a single layer. Flash fry the leaves for 90 second just before they start to brown and remove them carefully to a paper towel-lined plate with a slotted spoon. Add the shallots to the same pan and turn the flame down to medium and sauté for 4 minutes. 5. Add the squash ribbons to the pan, adding another tablespoon of oil and cook for 2 minutes. Add the salt and chopped sage leaves and cook for another 3 minutes. Divide squash into bowl and serve with whole fried sage on top. Serve with parmesan cheese.